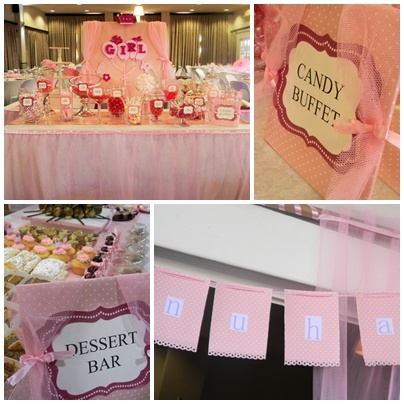 This pretty pink event was a Baby Viewing for Baby Nuha. A Baby Viewing, unlike a Baby Shower, is done after the birth of the baby. It gives everyone an excuse to get together and see the new little bundle that has arrived. There were lotsa eyes to view baby Nuha at this viewing as it was a 190 people event. The baby's Gran, Mom and Aunt spent months planning this event and we met lotsa times to make sure everything was perfect. A sweet Candy table, Dessert Bar and a Tea Station complete with hot chocolate spoons for these chilly winter days! Candy Buffet, Dessert Bar and oh-so-sweet buntings. We made these adorable little signs for the buffet tables. They each had little tulle drapes tied with pink satin bows. We re-wrapped ordinary Pink Fizzers and created these! The new Mom saw a previous post where we featured a Marshmallow tree here on the TCP on the B blog. She asked if we could do one for her event too. Here, we used a silver pot with a flower cut out edging. We added the tree to her Candy Buffet. 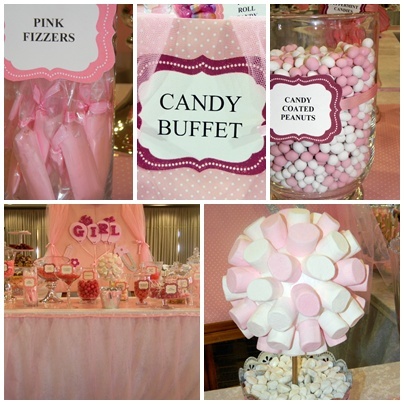 All four buffet tables were dressed with pink tulle skirts with satin ribbon edging. We love ! Hot Chocolate Spoons with pink & white mini mallows. Our Fav!! Pink Candy Floss! Two of these Candy Floss "trees" stood at the entrance way of the event. We personalised each bag with these little tags. The entrance way 'Baby Nuha' buntings with a dotted and scalloped edge pattern. The pink tulle drapes at the entrance. Having a little boy with cars, trucks and trains, an opportunity for a girly pink party, and I'm on board! This one was for little Ammaarah's 2nd birthday. 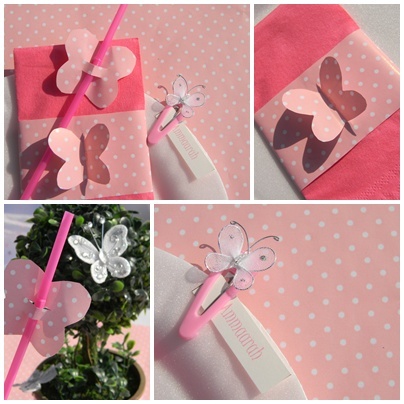 Her Mom asked for a butterfly theme and wanted it to be light and breezy, and pink, of course. Little lollipop trees with sparkly butterflies resting ever so gently on them, tulle drapes and an oh-so-cute marshmallow tree were some of the elements we used for this event. 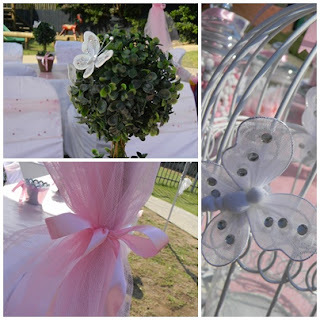 Breezy pink tulle drapes, lollipop tree centrepieces and our resident birdcage all dressed up in sparkly butterflies. We had these larger sized butterflies hanging from the gazebo. The client sourced a butterfly pinata seen here in the background. Hand-made napkin wraps and straw decor too. All with the sweet butterfly theme. We hand-made these cute little hair clips and used them to hold down the place cards. As much as we wanted, and as hard as we willed the wind to stop, we couldn't lay out the table settings as the wind proved too strong. Ammaarah's Mom laid them out just before guests arrived. 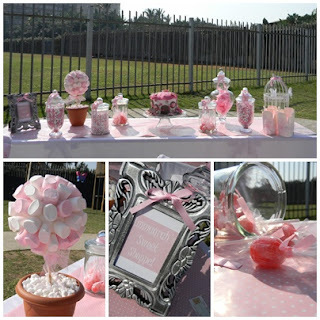 The sweet pink sweet table. Hand-wrapped lollipops tied with pink satin ribbon. We had to have pink candy floss. Our fav! The topiary ball marshmallow tree! We hope the kids enjoyed eating this as much as we loved making it. The buntings that hung over the sweet table. We used the same pink patterned polka dot paper to match the runners and table settings. Favour boxes for the kiddies to fill with sweets from Ammaarah's Sweet Shoppe. Each wrapped up in a tulle bow and a pink polka dot tag. 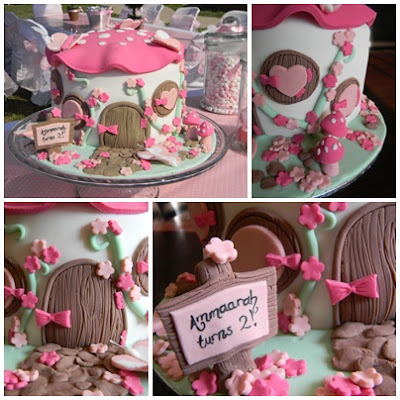 A sweet toadstool cake by the talented Nabeela of Nabeela's Bakeshop. Our new little business cards!